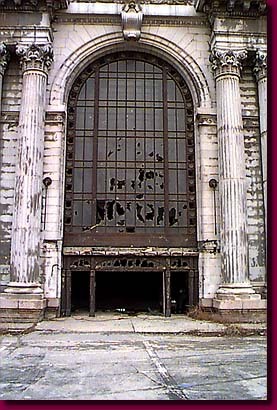 Gateway to immigrants and visitors to Detroit for decades, Michigan Central Railroad Station saw millions of people pass through its doors. Now a massive ruin of eerie proportions it houses a single visitor. Partially visible in the right door, a local wino has taken refuge from the misting rain with his bottle of wine.